The evening, compered by Dr. Lorcan Byrne will celebrate arts in the Midleton and surrounds community, including poetry with Paul Casey and Julie Goo, a short film on Seamus Heany by Sean Monaghan, two award winning shorts Stolen by Yvonne Keane and The Handsome Shadows by Mark Cogan. The final hour Ian Date and I will present The Intimate Hour, a powerful mix of blues, classical and jazz from various countries and influences. Ian Date on guitar, trumpet and vocals, is a virtuosic guitarist from Australia and has just finished recording an album with Tommy Emmanuel. This concert promises to be sparkling with virtuosity and beauty! The whole evening will be a vibrant and entertaining celebration of local excellence. Ian Date, guitar, trumpet, vocals. The evening, compered by Dr. Lorcan Byrne will celebrate arts in the Midleton community, including poetry with Paul Casey and Julie Goo, a short film on Seamus Heany by Sean Monaghan, two award winning shorts Stolen by Yvonne Keane and The Handsome Shadows by Mark Cogan. The final hour will be "The Intimate Hour", with Ilse de Ziah cello, and Ian Date guitar, trumpet, vocals, performing a powerful mix of blues, classical and jazz from various countries and influences. 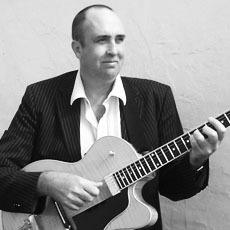 Ian is a virtuosic guitarist from Australia and has just finished recording an album with Tommy Emmanuel. This concert promises a virtuosic and beautiful performance from these world class musicians. A vibrant and entertaining evening celebrating local excellence. This entry was posted in Concerts and tagged cello, guitar, ian date, jameson distillery, Living the tradition, mid-may arts festival, midleton, trumpet on April 26, 2015 by ilse.